EuroCave's adjustable shelf* is ideal for bulk storage. Depending on the shelf configuation, the adjustable shelf will hold up to 61 bottles** of wine. There are no tools required for installing, moving or removing the shelves. This shelf is trimmed with Beechwood, a lighter more eco-friendly wood. Please check the description of the EuroCave Wine Cellar it will be used in or call 800.377.3330 to verify what shelves should be used. EuroCave's adjustable shelf* is ideal for bulk storage. Depending on the shelf configuation, the adjustable shelf will hold up to 61 bottles** of wine. There are no tools required for installing, moving or removing the shelves. *This shelf is for the EuroCave Performance Built-In and Compact Series. 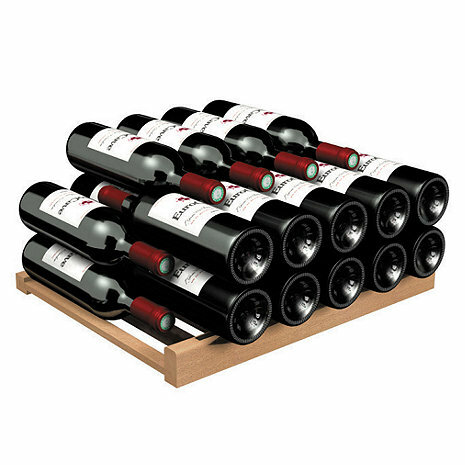 **Bottle capacities are approximate maximums when using standard Bordeaux 750mL bottles. Will these fit my Eurocave Compact 256? Fit into the EuroCave perfectly. Nice and sturdy. Holds a lot of bottles with no problem.